There really is a difference. And right now we’re loving fougasse. So much that we have entirely rejected the idea of making focaccia. 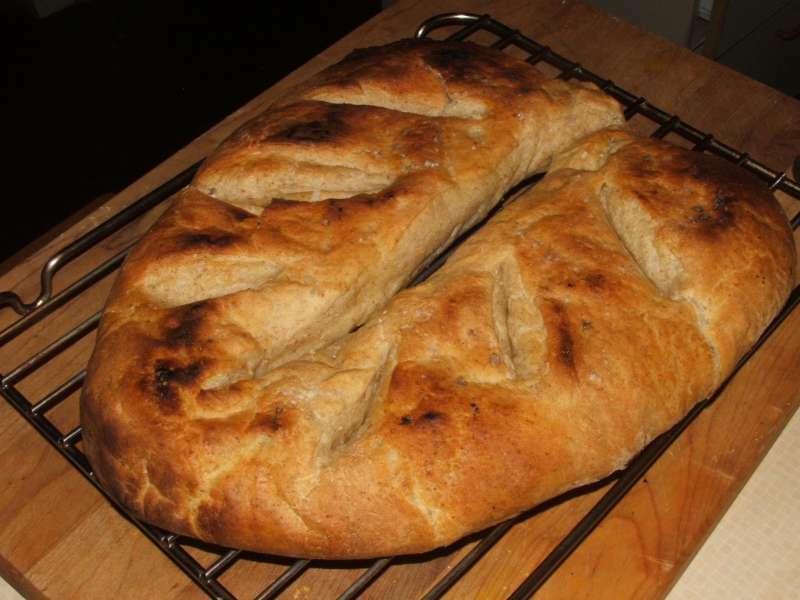 Our fougasse craze started after reading about Chad Robertson’s fougasse in “Tartine Bread”. (It’s a GREAT book!!) But because of still being certain – what with my terrific retention skills when reading – that fougasse was simply French focaccia, I used the ingredients for our focaccia recipe along with Robertson’s shaping and baking method to make our first fougasse. Amazingly, not only is the fougasse quite different from focaccia (even using the same dough), but both of us have decreed that fougasse is superior to focaccia. At least that’s what we think right now. 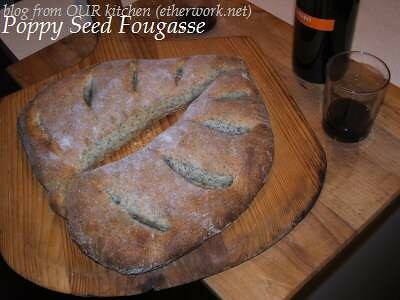 Because fougasse is baked on a stone instead of on an oiled pan, there are more crispy bits. Not too crispy though… it’s juuuuust right! Of course, it can be cut with a knife but we think that fougasse tastes better torn apart. After the first couple of times making fougasse, I noticed that in his book, Chad Robertson suggests using baguette dough for making fougasse. ie: no oil in the dough itself. So we tried that too. And it was good. Really good. 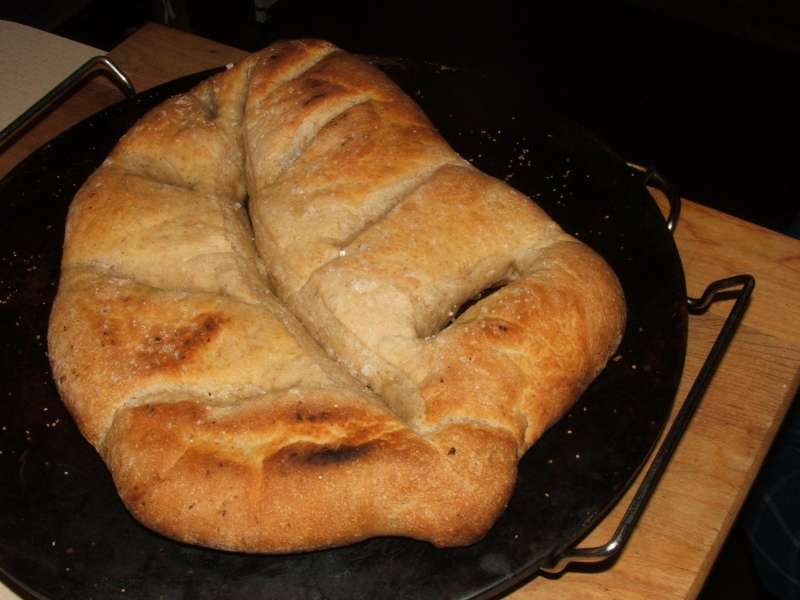 We’re not sure if it was better than fougasse made with focaccia dough. Just different. It’s the shaping, slashing and baking that will produce the characteristic (I think) fougasse texture and flavour. Yes. We love fougasse so much that we can’t stop making it! I’m thinking that once you start making it, you won’t be able to stop either. 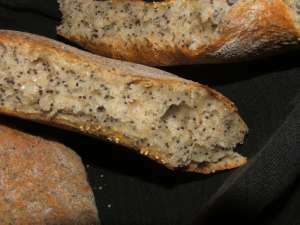 So far I’ve made fougasse using focaccia dough or baguette dough; plain with oil drizzled on before; plain with no oil drizzled on until just after baking; with poppy seeds added to the dough; with black olives; plain drizzled afterwards with oil infused mushrooms. All were a little different but all were equally delicious. Of course, I’m hoping that you too neeeeeeed to make fougasse and will now bake along with us. To receive a Baking Buddy Badge to display on your site: bake fougasse in the next couple of weeks and post about it (we love to see how your bread turned out AND hear what you think about it) before the 29 October 2011. Please read here (this is a link) for details on how to participate. It does look a little like pastry on the outside, doesn't it? But it's quite bread-like inside, Varda. And beautifully crusty on the outside. I was really thrilled with this poppy seed fougasse. Next time you mix focaccia dough, please do shape it like fougasse and give it a try. Fougasse is pretty fabulous. Is there a link to see the Hamelman's "Bread" version of your fougasse, B? Sorry, I was having trouble uploading pics!